Therefore, anyone who professionally invests money into private companies is in the Private Equity business. If it is in the early stages of a company, it is called Venture Capital. When I got into VC as an intern and then an analyst at Redpoint Ventures, I sat on a 50 minute flight from SF to LA with a principal at a VC fund. I think we had 3 beers on the flight (sweet drink tickets) and I walked away with a better idea of what VCs really do and 2 sheets of marked up scrap paper that I still have today. Who needs an MBA when you’ve got time to kill on Southwest? Basically, VC’s are money managers. They are just like your guy at Merrill Lynch who is telling you to diversify your portfolio to decrease risk. They want to support entrepreneurs but in the end their main goal is to provide their investors with the best return possible. Some people like to think that working in VC is about taking big risks. In reality, it is about managing risk. First let’s take a look at the traditional fund types and the levels of risk that they prefer. These are traditional early stage funds like Sequoia, KPCB, Redpoint, etc. They are looking to fund transformational businesses and aim for returns of 10x+ on their best investments and IRR’s or 25%+ over 7-10 years. The best funds can demand more than the 2% management fee and 20% carry that is considered the norm in private equity. I’ve heard of funds taking higher management fees in the early years of the fund and 30% carry. in general the partners in these funds invest alongside major institutional investors such as the Harvard or Yale Endowment. They often invest ~$3-5M and can demand 40% of a company. They will continue to invest on follow-on rounds to maintain a high percentage. They will invest in startups with high levels of team, market, and technical risk. Most of the time there isn’t any financial data to analyze. Startups might put some financial projections on the last slide of their deck, but nobody pays it much attention. In the long run many of their investments will fail, some will break even, a few will return 2-5xs on the investment and one or two will hit it out of the park and return the entire fund. These funds like to invest in companies that are a little further along than the early stage funds. Generally there is less technical risk on the table and part of the team has been built out. Since some of the risk is off the table and generally another institutional fund has already made an investment, valuations are higher and thus the new investor is not able to obtain as much of the company as they might like. Since these funds are supposed to be “safer,” they don’t promise their investors as high of a return as early stage funds. They aim for 5-10x returns on their best investments and since they expect fewer strikeouts, they aim for a 20%+ IRR. Dag Ventures is a typical fund in this space. Their approach is to build relationships and join the best early stage funds (Sequoia) in the second round of financing. In good times, these funds will do well. In bad times, they will get crushed. In my opinion, this is probably the worst stage to be an investor. Aim for 2-5x return on individual investments and 2-3 years to an exit/IPO. They expect that they won’t lose money on many investments but won’t have huge winners. They are investing in companies that have a full team, revenues, products, sales people, etc. This is basically financial engineering – you can see where the company is going, it just needs a quick influx of cash to get there. Strong funds in this space are TCV, Summit, Oak, etc. 4. Angels and everybody else – We can get to this later. Now the job of these funds to look at the 4 main types of risk. Some investors say they focus on team, while others focus on market size, or their own thesis, but whatever they tell you, they definitely look at these 4. They are slightly different than the 4 Mark Suster recently posted. In an investment there can be anywhere from a major risk to low risk. One one end of the spectrum you could have a college kid, on the other, a former CEO of a $100M+ revenue a year company. When VCs look at an entrepreneur they ask questions like, “Has he been successful? Is this his 2nd/3rd company? Is he smart/what school did he go to? MIT > Hollywood Upstairs School of Technology. What functional areas does the team have? Are they all engineers? Or do they have someone who can handle the Tech, Vision, Marketing, Business Development, and Operations roles? The key here is not to invest in a 3 legged horse. Is the founder stubborn with ownership? If he wants to own 100% of the company, he is not going to be able to surround himself with a good team. Has the CEO been able to recruit good people? Can this market support a company doing $100M a year in revenue? Is the market super fragmented? Could they consolidate it? Ex. Homeaway did this with vacation rentals. Who are the competitors? Ex. Search is huge, good luck with Google. How long will it take them to build it? How many miracles will it take for them to build it? Are there any potential huge problems to overcome? How much capital is going to be need to give yourself a chance? Are there going to be milestones the company needs to hit to complete the raise? How quickly does the company need to get to market? More money = Quicker. For an early stage investment, the more money you invest the higher the potential return needs to be. Otherwise there are less risky investments that could take large investments and have a guaranteed lower return. After you look at risk, most investing is about instincts. Do I like this guy? Do I want to be a business partner with him for 7 years? Do you think he is tough enough to make it? Is he also humble enough to take a step back if he is not performing and an new CEO needs to step in? Is this a market that you are passionate about and want to learn more about? If you lost all your money but learned a ton about that market that would help you in future investments, would it be worth it? Do you like the co-investors? Will this investment strengthen your relationship with them and produce a source of high quality deal flow? 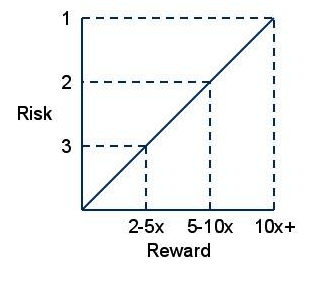 The best returns (and the way I’d prefer to invest) will come from people who invest in very early stage high risk/return deals. Since I don’t have the cash to swing for the fences on every deal, I also make smaller bets where I believe that the risk is low enough that I won’t lose everything. I’ve started to make a few angel investments. So what do I look for? A strong leader and a small team of 2-3 founders. A market that I understand where I hope to provide solid feedback for the founder. An idea that I think I can help raise another round of funding for through my network if this round isn’t enough to make it take off. How big do I think the outcome to be? If the best outcome is $25-50M I’d like to see early revenue or a clear path to it. Some risk needs to be taken off the table to make a 25K-50K bet without a huge potential upside. If I like the entrepreneur and think it can be a billion dollar company, then I might invest in an idea and a good handshake. Can I make this decision in the next week and not look back? I also like to think that regardless of the ROI, I’ll learn something that will help me with my own startup or future investments.